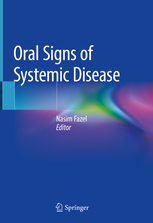 This book provides a comprehensive overview of oral signs of a broad spectrum of systemic diseases including gastrointestinal, hematologic, and endocrine, in addition to infectious, nutritional, autoimmune, genetic and connective tissue diseases. An overview of associated key signs and salient features to look for on oral exam is provided as well as other clinical manifestations, differential diagnoses, and treatment recommendations. The mouth is an important anatomical location with a role in many critical physiologic processes that are frequently involved in conditions that affect the skin or other organ systems. In many instances, oral manifestations of a disease precede the appearance of other stigmata. Therefore, early recognition of oral signs and symptoms associated with underlying systemic diseases can be invaluable to the clinician in establishing a diagnosis and prompt initiation of therapy. This book, written for dermatologists, dentists, otolaryngologists, and oral medicine specialists, offers a structured approach to the therapy and management of diseases affecting the oral mucosa.